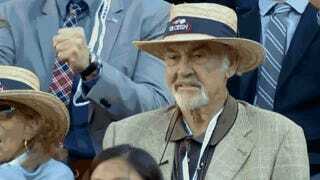 Sean Connery is watching the Novak Djokovic-Andy Murray U.S. Open men's final at Arthur Ashe Stadium this afternoon. Connery has been out in New York all weekend rooting hard for Murray, a fellow Scotsman. And after Murray won a point in that delirious first set of today's match? You're the man now, dog.